We've listened to your station from the beginning and have loved every minute of it. We really appreciate your church and KNVBC! We've listened to your station from the beginning and have loved every minute of it. It is turned on at 5:20 in the morning and is on until we go to bed. As a result, we have become a singing family. Keep it up and never change; your zeal, it's contagious! Thank you for your ministry and your stand. Thank you for your services for the Lord. May God richly bless you and your church family. Thank you so much for the free CD! Thank you most of all for remaining faithful after all these years. Thank you for the difference that you have made with your life, not only in California, but around the world. Amen! We are thankful for Revival Radio and for the ministry of Dr. Trieber and NVBC. We enjoy using the radio app. One of our favorite programs is Dr. Trieber's. Thank you! Keep up the good work! Just thought I would tell you that we purchased your blue 'Songs & Hymns of Revival' and last Sunday was our first Sunday with them and they were a great hit with the folks here. Thanks for your faithfulness and for your radio station. You bless my heart and your music warms the my Spirit. Thank you Brother Trieber and Brother Moyer and for your great church. I miss you all so much! This ministry is such an encouragement to me, even 2,600 miles away in Pittsburgh Pennsylvania. I love you so much Pastor, and I would like to thank you for letting the Lord use you! I watch your services on the internet and enjoy it very much. I enjoy the music so much. Your preaching is like what I grew up with. I enjoy listening to Revival Time Radio. Thanks for investing the time to influence the East Coast of the United States. Everyday, when I listen to KNVBC, I get encouraged to stay on God's way. It's wonderful to know that people in far away countries follow Jesus as we do. You are a real blessing with each song and each sermon. KNVBC has helped me so much in my Christian walk! Love this church so much! Thank you, Pastor Trieber for your vision to start such a wonderful Christian radio station. It's helped me so much in my Christian walk! Keep on keeping on! So grateful to God for your influence. I'm thankful that your influence is able to be broadcasted to a lot of people who may never have an opportunity otherwise. Thank you so much for KNVBC radio. I listen daily because I am always encouraged by your devotions and the uplifting music. I thank God for this ministry and pray that He will bless it for His glory! Thank you so much for this Godly music! Such a blessing to my family! Bro. Trieber, I have watched you since 1986 and back then you were an example that I wanted to learn from and now in 2012 I'm still learning from you. I love the spirit in which you serve the Lord and others. "Keep on keeping on!" Thank you for the wonderful music. I hope our station in Uganda will be as effective as yours here in America. God bless you! We appreciate listening to you. Thank you for standing on that ol' KJV! 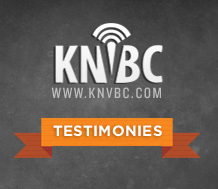 We always enjoy listening to your program on FBN Radio and often listen to KNVBC as well. We so much appreciate your stand on the Word of God (KJB). You are such an encouragement to us. We must drive 75 miles to a good church. Thanks for your encouragement in the Chrsitian life. God bless you and your church family. Thank you for your faithfulness to our Lord and the great encouragment you are to others. Thank you so much for the blessing from this radio station. It has been such a blessing ever since our assistant pastor told us about it. My family and I so appreciate this ministry! I almost always have your station playing in the background of whatever is going on in our house. My two year old daughter loves it just as much as I do. If it's not on, she runs over to the iPod dock and says, "Turn on the music mom!" Such a blessing to raise my children around God-honoring music! Not to mention the preaching, testimonies, and everything else we get to enjoy. Thank you so much! Praying for many more years of ministry for you and this awesome station! How fun to hear friends on the radio! Hearing classic messages by Pastor Trieber is my absolute favorite! Thank you so much for making the sacrifices necessary to have this station. I keep it on literally ALL the time in the office. Well, sometimes I have to turn it off when I'm choosing music for Sundays. One of my favorite times of day is after hearing the news, I hear the trumpet choir play. It means its time for preaching! I think of all the programming you have, hearing classic messages by Pastor Trieber is my absolute favorite. Again, thank you for making the sacrifices to have KNVBC. This ministry is such an encouragement to all who listen. Revival Radio has been a great blessing to my ministry, family and my personal walk with Christ. I listen to it every day at home and at work. I also encourage my choir to listen online. I praise the Lord for you Pastor Trieber and I pray that the Lord will keep blessing your ministry at North Valley Baptist Church. Thank you for being there 24/7. God has used you to be a blessing to our family! What a blessing it is to my family. May the Lord continue to bless. Thanks for your broadcast! You are an encouragement to listen to! Your energy brings excitement to want to live the Christian life. Keep preaching the Word! What a blessing this station is for us. To God be the glory! We're excited for what the Lord has in store for this ministry. Rest assured we'll keep listening! Thank you, Pastor, for vision, faith, and perseverance for this wonderful Christian radio station. You are the best! KNVBC has helped keep us faithful to God during the week! KNVBC has meant a lot to us during our long commutes these past two years. It has helped keep us faithful to God during the week and has brought us closer together as husband and wife! Thank you for this great blessing in our lives. May God bless this ministry in great and mighty ways in the days, weeks, months and years ahead! We are among your greatest fans and love you both. We are listening this morning in our home. What a blessing this station has been in our home over the past 2 years. I'm thankful for good Christian music you can trust being played in our home and for such a variety. We are faithful listeners! Pastor Treiber, thank you for your love toward your people. Thank you also for your radio station. I listen to it almost all day while I work. We love the station and listen to it often. We love you Bro. Trieber! Keep it up. May God continue to bless this great ministry. Please know that I am praying for you. Loving the program! It's great to hear you Bro. Trieber. Have a great day. Thanks for encouraging all of us! I came to hear your radio station this past year at the Pastors' and Workers' conference and boy, was it a blessing! I even went down to the room where it is held and I was determined to get a better phone so that I could hear the beautiful music and your preaching and teaching. Praise the Lord for the radio station and being able to wake up every morning and hear some good and godly music to start the day. May the Lord continue to bless you and your ministries. Truly a blessing! listen everytime I can! This station is a haven for those of us who cling to the convictions of God honoring music. Thank you for your the radio station. I listen daily and it is a part of my daily routine! When others are playing contemporary junk, this station is a haven for those of us who cling to the convictions of God honoring music and news. Thank you again for your radio station. Thank you so much for your ministry. You encourage us all the way in Belarus! Love North Valley! We love KNVBC! Thank you all for everything! To God be the glory. I will look into getting a link up on our website. I am all for encouraging others to listen to good godly music and Bible preaching. You all are doing an awesome job! Congratulations to the 2nd year of KNVBC. We are so grateful for giving us a wonderful pastor! Congratulations also for your 36 years in NVBC. We are always praying for you and Mrs. Trieber and your family. Praise the Lord for knvbc and GSBC! It has been such a blessing to my family, my daughter graduated in 2010 and my son is a sophomore this year. Thank you for your servant's heart, Pastor Treiber. Thank you for having this radio station for us to listen to. It is such a blessing throughout the day. Thank you for the great Godly music and preaching your radio station broadcasts. It is refreshing to have a ministry and a place to go as a christian. Its always a blessing to listen to knvbc. I want to say what a blessing it is to listen to the radio and be able to hear great Christian Music. I take turns each day listening between the radio and the on line services. I also want to say thank what great people you have at your church. I'm listening to your station and I can't wait to see what I learn from it. May God bless you with more years. I cannot find anywhere else the quality and integrity of your programming. Your online radio station has been such a tremendous blessing! I always recommend it to others! God bless. Your music has ministered to my soul this morning and uplifted my spirit to the Heavens! I am strengthened anew! Thank you...thank you, thank you, for such wonderful music. This morning I feel the Lord chose each song just for me. May God continue to bless the ministry at NVBC, thank you for you love and support and this wonderful music ministry! Thank you Pastor Trieber for all your years in the ministry, it encourages me to find what God has in store for me. We had almost given up on any stations playing any true spiritual hymns. We and our children love the old hymns and our spirits have been drawn closer to the Lord because of you. We are so grateful for the time that is spent sifting through the music to find what is excellent. Please do not compromise your standards, there are many of us who are out here who are starving for good wholesome hymns and spiritual songs. So thankful for music and making this available for iPhone. This station is a great help in brightening my day and a catalyst for revival in my life. It's great to listen to the Bible being teached and preached around the world. Stand firm in the faith and may God use this ministry to do a great work! I will remember you in prayer. God bless you all. Thank you so much for your service to and leadership of the Lord. We have NO good Christian radio station in the Atlanta, Georgia area. What a blessing to stream your station into our home and church. I love it!! I also love going to the archived video page to listen to so many messages. Because of it, I can have church every day and love every bit of it! A few weeks ago I became ill and could not go to church, but because of your live stream, I was able to attend your church via internet. Thank you so much!! The ministry there is such a great blessing to me here in Braselton, GA. Praise the Lord for KNVBC!! I am so proud for you and thankful that you are a true beacon of the old time religion! 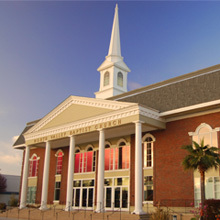 The music, preaching and programs are a blessing and an encouragement. Keep on keeping on! God bless you Pastor Trieber and the church! I wanted to thank you from the bottom of my heart for your vision to have this radio station. I'm sure it's a blessing to so many people, but especially to me. Thank you so much and may God give you many, many more years to serve Him. It really is a wonderful life, isn't it? Your ststion is like a breath of fresh air to our ears. Thank you for your radio ministry. It is such a blessing in our home. I recently ordered Mrs. Trieber's book "With All My Heart." It has truly touched my heart and given much help in being the wife and mother that is pleasing to God. Thank you for giving your life to the Lord and ministering to others. Thank you for your radio station. I listen to it on my iPad virtually all day. Thank you, also, for the Lester Roloff sermons. I appreciate that you are keeping his memory alive through your station! We need not let our " spiritual forefathers" pass off the scene. I love knvbc, my children and i listen all day-it brings such peace to our home and helps us focus on the Lord throughout the day-What a resource! thank you. Listening from Hungary! We enjoy KNVBC and listen often. May God bless you and stand strong! Thank you for the gift CD! I cannot begin to let you know with my words what a wonderful blessing it has been to myself and our family to be able to listen to your radio station at all hours of the day. I, personally, was so hungry for more music and preaching. We love every song, devotion, and preaching. Thank you for the great music. We listen to knvbc every morning. Most of the time it's the first think our kids hear as they are waking up! We love you and North Valley and GSBC! Your stations is such a blessing! I enjoy the song selections and hearing the live broadcast each morning is always a treat. I listen daily via my Droid phone. Your station encourages me when I am getting ready for soulwinning on Saturdays or just doing mundane housework. It always lifts my spirit! Thanks so much for your investment in my family. Thank you for making your station available on the iPad. I recently got an iPhone so I can listen to KNVBC when I am out of the house. Because we live in the wilderness of Illinois corn and soybean country, our reception is not always real good. I often tell people that you are one of my favorite preachers because of your gracious and kind spirit. Listen every morning right after prayer and Bible reading! I tell my friends I have CPR every morning: Coffee, Prayer and Reading! Our family thoroughly enjoys listening to KNVBC. My son has the app on his iPod so we take it all through the house with us and are blessed with beautiful, inspiring music all day long. Thank you for this wonderful ministry. We are praying for you. Thank you for the radio station. It is such a blessing as we are on the mission field. Bro. 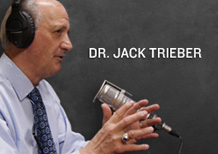 Trieber thanks for all you do to help promote Biblical fundamentalism and a godly heritage. I have never been to your church or met you in person, but through the internet I´ve had the privilege to hear your preachings which have been such an inspiration to our lives. Thank you for serving the Lord in such a way. May the Lord continue to use you. Only eternity will reveal the impact and encouragement your misistry has been. We are so greatful for the staff and Dr. Triebers ministry. I weep at times with joy to hear the old fashion preaching that calls sin, sin. The music is so uplifting!! We just love the whole team at NV. You definately live what you preach, "a Godly life! We enjoy reading the monthy email articles. We love Dr. Trieber and his godly wife! NV is so blessed with their leadship! If I lived in Sant Clara we would certainly pick NV to attend church. KNVBC has been such a blessing to my family. I also encourage our youth group at West Gate Baptist Church to listen so that they can get a better understanding of what good, godly music sounds like. Thank you to Bro. Trieber, Bro. Moyer, and all of the staff of KNVBC! Thank you so much for the ministry of KNVBC-Revival Radio. I listen every day at work and it truly is a blessing to have the uplifting music and programs to help me thru the day. I enjoy it all. Thank you for the ministry of KNVBC, as a pastor I listen often and I enjoy it very much. Thank you for this wonderful ministry. Thank you Dr Trieber for your tireless work for the Lord. I listen to the station daily and appreciate your wisdom concerning the local church!